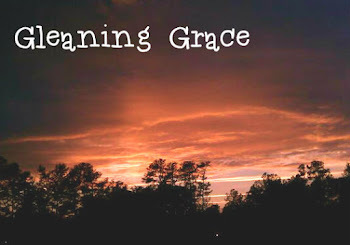 Gleaning Grace: saying "NO" with grace? I recently read a Mamapedia article about teaching your kids gratitude (read it here). I could really identify with the author on several accounts. We are fortunate to have two sets of parents that are still young and in relatively good health. They both live within about a one hour drive and often will come to stay with the kids while we go to appointments or even date nights. I am very appreciative of this! There's nothing that can spoil a date night like paying the babysitter almost as much as you spent on the date! However, with one set of grandparents, my children have come to expect that gifts will be coming with Grammy. This is because this grammy's house is OVER-RUN with toys and do-dads, all for my kids, the only two grandchildren she has. This Grammy also tends to bring stuff with her when she comes to visit; it could be a book or video she found at the thrift store or a new pair of pj's. Sometimes, it's the toy we previously denied our daughter because we felt she should save up and buy it herself (and learn some valuable lessons in the process). YES, that really happened, but in Grammy's defense, she didn't know that Sweet Pea had asked for that EXACT toy and been told "no." Please understand, we are super-duper grateful for all the help we receive from our parents! Without it, in the beginning, I might not have had the luxury (I use that term loosely :-)) of staying home with our kids. BUT, when your 4 year old makes comments about what Grammy might bring her versus the excitement of seeing Grammy, there's a problem, don't ya think? Does anyone else know that quote that says something like "LOVE to a child is spelled T-I-M-E"? Apparently not to my daughter...at least not where Grammy is concerned. I am all for providing better things for my child than I had growing up- or at least I used to think I was. Was there really anything wrong with the fact that I had to work in high school to help pay for my car insurance and gas? Was it really a big deal that I never had a phone or tv of my own in my room? Was it really a big deal that I learned early the value of hard work? Was it such a tragedy that I read books instead of playing a handheld video game all the time? NO, NO, NO and NO! I am so grateful for all of these things and plan to institute most of them with my kids. They do have some things that are better or different simply because times have changed. If Grammy wants to help us out with the kids, that's great! Let's keep it to necessities and useful items rather than a new toy they don't have room for! I am not concerned about the amount of money she spends on our kids- ultimately that's her and gramps' decision. However, it is my job as a responsible parent to teach my children that "money doesn't grow on trees" as my parents used to say. You have to work for it, or someone does, and you should think about how you spend it so as not to waste it. I don't want my kids to grow up thinking they can get anything they want as long as they ask, whine, complain enough about not having it. This same issue caused me to tell my 6 year old daughter the "Santa Secret" this year. In fact, I never wanted to start the Santa tradition with my kids for several reasons (if you want to read most of them, check out Texan Mama's post about it, here), but before I could really voice that Sweet Pea was here and enjoying her first Christmas at 7 months old. In future years, this Grammy went so far as to say that Santa stopped at her house for Sweet Pea too (yeah, I know, don't even get me started on this one). Again, my job is to teach my child responsibility, gratitude for what she has, and not to always want what someone else has (in my book that's coveting, and THE BOOK, addresses it in the 10 Commandments). How do I gracefully ask this Grammy to stop buying gifts for my kids, especially when they aren't needed, practical, or anything other than a "spoil?" Sadly, the discussion has already been had at least twice, so where do I go from here and how do I handle this with grace?